As a big fan of Japanese Dolly Dolly pattern magazines I often wondered at the lack of Barbie doll content in their pages. Apparently Barbie is just not popular in Japan. It could be that she looks too American with that tan skin and blonde hair. Little girls generally want doll that looks like them. The main doll in Japan is Momoko, and you will find there is always a selection of patterns for her in Japanese Dolly Dolly books. I heard that Barbie, Pullip and Momoko fit each other's fashions, but Momoko is slightly smaller. 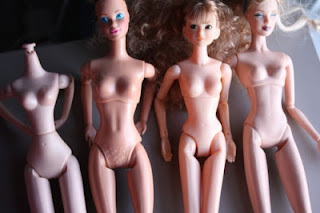 Here are some handy photos taken by 'The Toy Box Philosopher' of different doll bodies so we can compare. While Liv tops are a bit baggy in the shoulders and bust area, the shorts actually fit pretty well. Monster High clothing is way too small. Pullip is wider through the hips and thinner at the waist and has an extra torso joint. Momoko and Tangkou are very similar, right down to the specific way each of their joints moves...and the high-jointed appearance of the hips. I would definatly consider using Momoko sewing patterns to sew for babrie or Pullip, but there needs to be a little extra seam allowance added at the hips and bust.